What is your favourite holiday of the year? Wait! Don’t answer, please. I’ll try to guess. I believe it’s Christmas. It’s magic time full of joy, love and presents, of course. Do you know who invented the tradition of giving presents? You might have already heard about the Three Wise Men who followed a star to visit Jesus Christ when he was a baby and to give him presents: gold, frankincense, and murrh. This is how the tradition started. 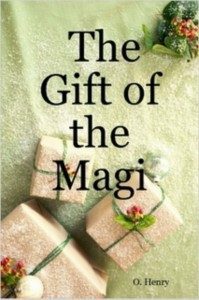 Today we are going to read a short story written by O. Henry, an American writer, “The Gift of the Magi”. Hope you will like it. One dollar and eighty-seven cents. That was all. And sixty cents of it was in pennies. Pennies saved one and two at a time by bulldozing the grocer and the vegetable man and the butcher. Three times Della counted it. One dollar and eighty-seven cents. And the next day would be Christmas. There was clearly nothing left to do but flop down on the shabby little couch and howl. So Della did it. It is true that life is made up of sobs, sniffles, and smiles, with sniffles predominating. Della finished her cry and attended to her cheeks with the powder rag. She stood by the window and looked out dully at a grey cat walking a grey fence in a grey backyard. Tomorrow would be Christmas Day, and she had only $1.87 to buy Jim a present. Her Jim. She had been saving every penny she could for months, with this result. Her husband Mr. James Dillingham Young or Jim, as Della called him at home, was paid only $20 per week. Twenty dollars a week doesn't go far. Expenses had been greater than she had calculated. They always are. Many happy hours she had spent planning for something nice for him. Something fine and rare – something worthy of the honour of being owned by Jim. Now, there were two treasures in which they both took a mighty pride. One was Jim's gold watch that had been his father's and his grandfather's. The other was Della's hair. 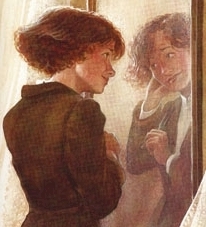 So now Della's beautiful hair fell about her, shining like a cascade of brown waters. It reached below her knee and made itself almost a garment for her. And then she did it up again nervously and quickly. Once she faltered for a minute and stood still while a tear or two splashed on the worn red carpet. She put on her old brown jacket and old brown hat. With the brilliant sparkle still in her eyes, she ran out of the door and down the stairs to the street. Where she stopped the sign read: 'Mme Sofronie. Hair Goods of All Kinds.' The old woman bought hair. «Will you buy my hair?» asked Della, panting. Down fell the brown cascade. «Twenty dollars,» said Madame, lifting the mass with a practiced hand. «Give it to me quickly,» said Della. Oh, and the next two hours Della was flying on rosy wings. She was ransacking the stores for Jim's present. She found it at last. It surely had been made for Jim and no one else. There was no other like it in any of the stores, and she had turned all of them inside out. It was a platinum fob chain simple in design as all good things should be. It was even worthy of The Watch. As soon as she saw it she knew that it must be Jim's. It was like him. Quietness and value — the description applied to both. Twenty-one dollars they took from her for it, and she hurried home with the 78 cents. At home Della got out her curling irons, lighted the gas and went to work. Within forty minutes her head was covered with tiny, close-lying curls that made her look wonderfully like a truant schoolboy. 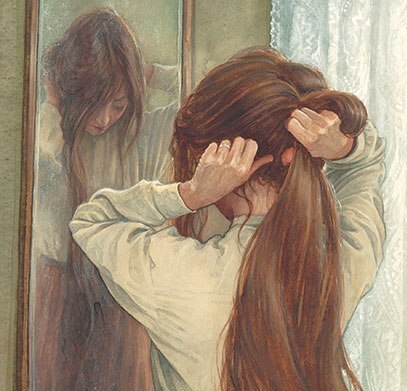 She looked at her reflection in the mirror long, carefully, and critically. The door opened and Jim stepped in and closed it. He looked thin and very serious. Poor fellow, he was only twenty-two — and to be burdened with a family! He needed a new overcoat and he was without gloves. Della jumped off the table and went to him. «You've cut off your hair?» asked Jim as if he had not arrived at that fact yet. Jim looked about the room curiously. «You say your hair is gone?» he said, with an air almost of idiocy. Jim seemed to wake out of his trance quickly. He enfolded his Della. Jim drew a package from his overcoat pocket and threw it upon the table. White fingers tore the string and paper. And then a scream of joy came out which quickly changed to hysterical tears and wails. For there lay The Combs – the set of combs that Della had worshipped for long in a Broadway window. Beautiful combs, pure tortoise-shell, with jewelled rims – just the shade to wear in the beautiful vanished hair. They were expensive combs, she knew, and her heart had simply craved and yearned over them without the least hope of possession. And now, they were hers, but the hair was gone. 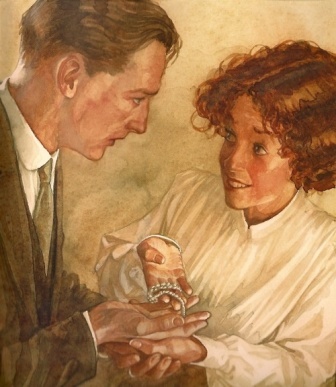 She hugged them to her bosom, and with tears in her eyes and a smile, was able to say: «My hair grows so fast, Jim!» And then Della leaped up like a little cat and cried, «Oh, oh!» Jim had not yet seen his beautiful present. She held it out to him eagerly upon her open palm. The magi, as you know, were wise men — wonderfully wise men — who brought gifts to the Babe in the manger. They invented the art of giving Christmas presents. Being wise, their gifts were no doubt wise ones. And here I have told you the story of two foolish children who unwisely sacrificed for each other the greatest treasures of their house. But let it be said that of all who give gifts these two were the wisest. Of all who give and receive gifts, such as they are wisest. Everywhere they are wisest. They are the magi. a Coney Island chorus girl – a woman who dances in a chorus line as a part of a stage production or play. Della knows that her hair now looks unnatural and artificially primped. She looks cheap. 1. Say whether these sentences are true or false. Correct them if they are false. Della wanted to buy Jim a present for his birthday. Della saved the money for a month. Jim was paid $20 per week. Della agreed to sell her hair for $20. Della found a present for her husband very quickly. Jim did not notice that Della had cut her hair off. The combs were made of tortoise shell. Della threw the combs away. Della’s hair grows very fast. 2. Match the words on the left with their equivalents on the right. 3. Form words with the negative prefixes and translate them into Russian. Use them in your own sentences. Эта запись написана автором Елена Шрамкова, 13.12.2016 в 03:02, и размещена в категории Christmas Time, Традиции и обычаи Великобритании. Следите за ответами на эту запись с помощью RSS 2.0. Вы можете написать комментарий или разместить обратную ссылку на своем сайте.